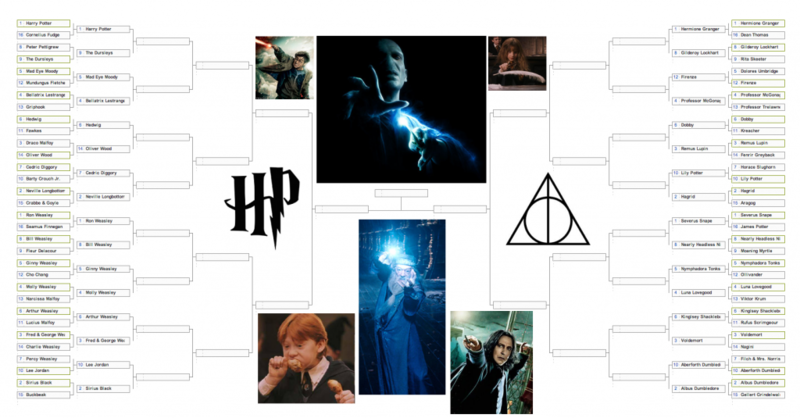 On Monday, we launched the first round of the March Madness-style HARRY POTTER themed bracket. After four days of routs, combined with a few upsets (Oliver Wood for Prime Minister) that Professor Trelawney likely could have predicted in her sleep (which is how she does her predictions), NOW we’re jumping into the dark, murky depths of the tunnels of Hogwarts (Basilisk beware! ), so deep and suffocating that even gillyweed wouldn’t save you. Only 32 characters remain to achieve glory, angling for a spot in the Sweet Sixteen. Click on the bracket below for a better glimpse at the witches, wizards, owls, centaurs, muggles, ghosts, house elves and half-giants that remain. For predictions and analysis from a lackluster Lee Jordan impression, check out our Nastily Exhausting Wizarding Bracketology. For commentary and tributes to the fallen favorites, consult Lee Jordan’s Unforgivable Bracket Results. The easy answers have been made. Round 2 and beyond will serve to give us the answers that even Bathilda Bagshot doesn’t know the answer to, and you certainly wouldn’t find in A History of Magic. Who is Potterverse’s champion of quirky and cool: Tonks or Luna Lovegood? Is Kingsley Shacklebolt the most underrated HP character there is? Will anyone vote for the Dursley’s against Harry? Can the humble Hufflepuff house and their savior, Cedric Diggory, take down Sir Neville Longbottom? Can evil triumph when Bellatrix battles Mad Eye? Who is the internet’s favorite Weasley: Can Ginny beat her mother? Will the twins topple their father? Is anyone losing any sleep over Percy Weasley’s elimination? Does Lee Jordan, the unofficial bracket mascot/host, have what it takes to continue his Cinderella run? Are Oliver “Gives Me” Wood, Lily Potter and Firenze built to last in this tournament? The answers are coming, as Round 2 begins. Voting lasts until Monday, April 21st, at 11:59 PM PT. Feel free to vote as often as you’d like, and tell your friends (muggle or otherwise) via owl or floo powder, unless you want to receive a howler when they find out you were sipping on Madam Rosmerta’s Butterbeers without them.